The Apostle has heard from Epaphroditus that the Philippian church has been practicing infighting. This is why he called them to humility, that in turn is in service to unity. When we are humble it leads us to put the needs of others before our own and that leads to a community united in mission. So where does it all start? The Apostle is clear it begins and ends with Christ. Salvation as a topic is one that is often treated in a reductionist way. To be sure, salvation is full and complete through faith in Christ alone and it is to be had only by the grace of God out of his good pleasure to bestow it upon us. Yet, salvation is more than a mere point in life when we surrender to God. Salvation is also a lifelong path of discipleship. While I will not bore you with a complete order of salvation here, let us look at two points within the category of salvation. There is a moment when we come to know Christ as Lord and bow our lives before him. This is justification and all too often justification is seen as the only moment of salvation. Beyond justification, however, is the long road of sanctification in which the Spirit continues to work among us to lead us to both desire (will) and actually do things for the glory of God. Sanctification trains us as Jesus' followers and sets us apart day by day as the Spirit continues to apply the saving work of Christ to our lives. Salvation is only ever of God, yet we grasp and live in and out of that salvation in the power of the Spirit. So what then of all of this fear and trembling? The Apostle is calling the Philippians to humility and unity. As he is in prison he cannot go to them, yet his authority still resides over them. He calls them to realize the power of salvation in Christ and how they must, TOGETHER, work out the implications of that salvation. This should be done in fear and trembling as they, an unholy people, now stand exposed to a holy God. It is not that somehow their work will gain their salvation, but rather they have salvation now they must figure out how to live together as the newly constituted people of God. At the time that I write this to you the United States has just had a presidential election. In the wake of a national election (and we only elect one position nationally every four years) the sharp and stark divides in our country are exposed. Some will gloat in victory. Some will lament in defeat. Others will take matters too far on both sides and use the election as an excuse for all sorts of vileness and hatred. Sisters and brothers, it cannot be so among us who call Jesus Lord. We have one Lord and as such, we are one people. Like the Philippians we need to learn to live and love together in the midst of differences. This is precisely what the Apostle is getting at in our passage this week. 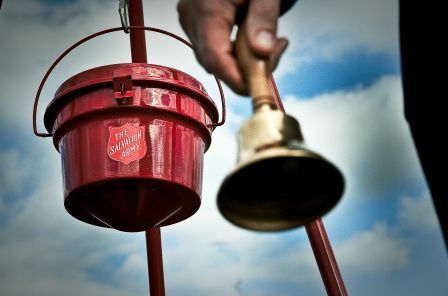 A big thanks to Elders Fred and Randy who will be heading up efforts to organize our bell ringing. We will have sign ups for ringing in front of Walmart beginning this Sunday. We are in need of a few more women to staff our Rotating Shelter Week. Specifically November 15 and 17. If you can donate one night to the shelter this week we will be sure to give people a warm place to sleep if they need it.